Starbucks will pay the university tuition fees for its UK employees who want to study with a US college. The Seattle-based coffee giant said on Tuesday it will offer eligible employees the opportunity to have 100 per cent of their degrees paid for when they enrol on online programmes with Arizona State University (ASU). 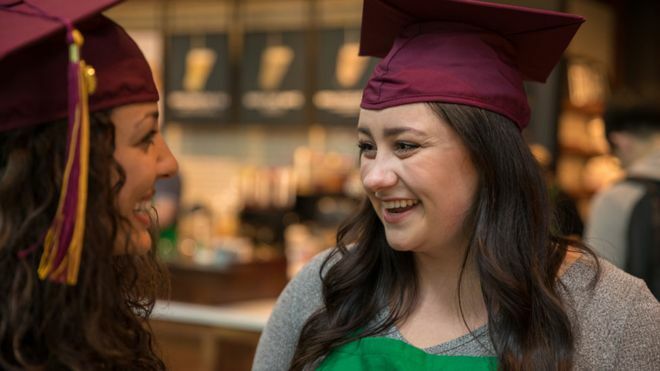 In 2014 Starbucks and ASU first partnered to offer the same opportunity to US employees. Since then, 18,000 US “partners”, as Starbucks employees are known, have enrolled in the programme, and more than 2,400 have graduated. Martin Brok, president of Starbucks Europe, Middle East and Africa (EMEA), explains that Starbucks has “always been a company that puts our people first”. “And if we can remove the financial burden of the cost of a university degree while helping our partners gain skills that will set them up for future success – we can’t think of a better investment,” Mr Brok adds. Through the education programme, UK Starbucks employees will be able to choose from more than 40 courses, ranging across Bachelor of Science and Bachelor of Arts degrees. Furthermore, all students will also be granted an enrolment coach and academic adviser throughout their degree. “ASU’s ability to scale through innovation and technology, allows us to reach learners across the globe, in the effort to provide an education to all who desire to learn,” says Michael Crow, president of ASU. In order to be eligible for the programme, UK Starbucks employees must have worked for the company for at least three months prior to submitting their application. Furthermore, they must not already have a Bachelor’s degree, nor be taking part in any other form of full-time education. The programme will initially be available to 100 employees for courses starting in October. Applications opened on Tuesday. The deadline for applications is 30 June, with places on the programme being allocated on 1 August.